^ "ZERO DARK THIRTY (15)". British Board of Film Classification. November 28, 2012. Retrieved November 28, 2012. ^ a b c "Zero Dark Thirty (2012)". Box Office Mojo. IMDb. Retrieved February 5, 2013. ^ Rodriguez Jr, Jose A, (January 3, 2013). "A CIA veteran on what 'Zero Dark Thirty' gets wrong about the bin Laden manhunt". The Washington Post. Retrieved January 15, 2014. ^ Shane, Scott (December 22, 2012). "Acting CIA Chief Critical of Film 'Zero Dark Thirty'". The New York Times. Retrieved January 15, 2014. ^ Bowden, Mark (January 3, 2013). "Zero Dark Thirty' Is Not Pro-Torture". The Atlantic. Retrieved January 15, 2014. ^ Barrett, Annie (August 6, 2012). "First Look: Obama not in 'Zero Dark Thirty' thriller about hunt for Osama bin Laden – Exclusive". Insidemovies.ew.com. Retrieved January 19, 2013. ^ "The dream set". The Tribune. April 1, 2012. Retrieved February 24, 2013. ^ "Manimajra residents hope 'Zero Dark Thirty' will win Oscar". The Times of India. February 12, 2013. Retrieved February 24, 2013. ^ "Golden Globe winners list". USA Today. January 13, 2013. Retrieved January 15, 2013. ^ a b Hersh, Seymour (May 21, 2015). "The Killing of Osama bin Laden". The London Review of Books. The London Review of Books. Retrieved May 11, 2015. ^ "Osama Bin Laden was an unarmed elderly 'invalid' when Navy Seals killed him and Barack Obama lied about the mission, report claims". The Independent. May 11, 2015. Retrieved May 11, 2015. ^ Schwarz, Jon; Devereaux, Ryan (May 12, 2015). "CLAIM: SY HERSH'S BIN LADEN STORY IS TRUE — BUT OLD NEWS". The Intercept. Retrieved May 12, 2015. ^ Cole, Matthew; Esposito, Richard; Windrem, Robert; Mitchell, Andrea (May 11, 2015). "Pakistanis Knew Where Osama Bin Laden Was, U.S. Sources Say". NBC News. NBC News. Retrieved May 12, 2015. ^ "White House dismisses new Osama bin Laden raid claims". Telegraph. May 11, 2015. Retrieved May 11, 2015. ^ Lamothe, Dan (May 11, 2015). "'Utter nonsense': CIA and White House blast Seymour Hersh's explosive Osama bin Laden raid story". The Washington Post. Retrieved May 9, 2018. ^ Hudson, John (May 17, 2012). "Is Harvey Weinstein Plotting an October Surprise for Obama?". The Atlantic Wire. Archived from the original on May 20, 2012. Retrieved May 24, 2012. ^ a b Bruni, Frank (December 8, 2012). "Bin Laden, Torture and Hollywood". The New York Times. Archived from the original on December 9, 2012. Retrieved December 10, 2012. ^ Cieply, Michael (January 6, 2012). "Film About the Hunt for Bin Laden Leads to a Pentagon Investigation". The New York Times. Archived from the original on August 21, 2018. Retrieved January 22, 2019. ^ Hosenball, Mark (January 2, 2013). "Senate panel to examine CIA contacts with 'Zero Dark Thirty' filmmakers". Reuters. Archived from the original on January 4, 2013. Retrieved January 4, 2013. ^ Hosenball, Mark (February 25, 2013). "Senate Intelligence Committee drops bin Laden film probe". Reuters. Archived from the original on February 28, 2013. Retrieved March 1, 2013. ^ Fox, Jesse David (December 10, 2012). "Does Zero Dark Thirty Endorse Torture?". Vulture. Archived from the original on December 13, 2012. Retrieved December 10, 2012. ^ Bazelon, Emily (December 11, 2012). "Does Zero Dark Thirty Advocate Torture?". Slate. Archived from the original on December 12, 2012. Retrieved December 11, 2012. ^ Maass, Peter (December 13, 2012). "Don't Trust 'Zero Dark Thirty'". The Atlantic. Archived from the original on April 20, 2018. Retrieved January 22, 2019. ^ Mayer, Jane (December 14, 2012). "ZERO CONSCIENCE IN "ZERO DARK THIRTY"". The New Yorker. Archived from the original on December 15, 2012. Retrieved December 16, 2012. ^ Gibney, Alex (December 21, 2012). "Zero Dark Thirty's Wrong and Dangerous Conclusion". The Huffington Post. Archived from the original on December 24, 2012. Retrieved December 25, 2012. ^ Slavoj Žižek (January 25, 2013). "Zero Dark Thirty: Hollywood's gift to American power". The Guardian. London. Archived from the original on November 20, 2013. Retrieved March 18, 2013. ^ Staff (December 18, 2012). "Sen. McCain rejects torture scene in 'Zero Dark Thirty'". Entertainment Weekly. Archived from the original on December 19, 2012. Retrieved December 19, 2012. ^ Daunt, Tina (December 19, 2012). "Senators Call 'Zero Dark Thirty' 'Grossly Inaccurate' in Letter to Sony Pictures". The Hollywood Reporter. Archived from the original on December 31, 2012. Retrieved December 20, 2012. ^ Daunt, Tina (December 21, 2012). "Acting CIA Director Disputes 'Zero Dark Thirty' Accuracy in Rare Public Statement". The Hollywood Reporter. Archived from the original on December 22, 2012. Retrieved December 22, 2012. ^ a b Denson, G. Roger (December 31, 2012). "Zero Dark Thirty Account of Torture Verified by Media Record of Legislators and CIA Officials". The Huffington Post. Archived from the original on January 3, 2013. Retrieved January 17, 2013. ^ Denson, G. Roger (December 25, 2012). "Zero Dark Thirty: Why the Film's Makers Should Be Defended And What Deeper bin Laden Controversy Has Been Stirred". The Huffington Post. Archived from the original on December 25, 2012. Retrieved December 28, 2012. ^ Ackerman, Spencer (December 10, 2012). "Two Cheers for 'Zero Dark Thirty's' Torture Scenes". Wired. Archived from the original on March 26, 2014. Retrieved December 11, 2012. ^ Kenny, Glenn (December 17, 2012). ""Zero Dark Thirty:" Perception, reality, perception again, and "the art defense"". Some Come Running. Archived from the original on December 25, 2012. Retrieved December 19, 2012. ^ Sullivan, Andrew (December 14, 2012). "Kathryn Bigelow: Not A Torture Apologist". The Daily Beast. Archived from the original on December 16, 2012. Retrieved December 15, 2012. ^ O'Hehir, Andrew (December 1, 2012). "Is feminism worth defending with torture?". Salon. Archived from the original on December 9, 2012. Retrieved December 10, 2012. ^ Pond, Steve. "'Zero Dark Thirty' Steps into the Line of Fire, Answers Critics". The Warp. Archived from the original on December 12, 2012. Retrieved December 12, 2012. ^ Bowden, Mark (January 3, 2013). "'Zero Dark Thirty' Is Not Pro-Torture". The Atlantic. Archived from the original on September 1, 2016. Retrieved January 13, 2013. ^ Winter, Jessica (January 24, 2013). "Cover Story: Kathryn Bigelow's Art of Darkness". Time. Archived from the original on January 24, 2013. Retrieved January 24, 2013. ^ a b Michael Cieply (February 23, 2013). "9-11 victim's family raises objection to Zero Dark Thirty". New York Times. Archived from the original on February 24, 2013. The Ong family is also asking that the filmmakers donate to a charitable foundation that was set up in Ms. Ong's name. 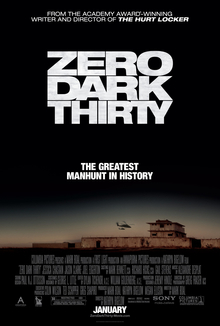 Further, they want Sony Pictures Entertainment, which is distributing Zero Dark Thirty in the United States, to include a credit for Ms. Ong and a statement on both its Web site and on home entertainment versions of the film making clear that the Ong family does not endorse torture, which is depicted in the film, an account of the search for Osama bin Laden. ^ "9/11 families upset over "Zero Dark Thirty" recordings". CBS News. February 25, 2013. Archived from the original on February 28, 2013. Retrieved February 28, 2013. This page was last edited on 25 March 2019, at 08:10 (UTC).